One of Pelikan’s defining features is the iconic beak clip which has been around since the end of the second World War. If you have ever had occasion to look at the underside of a post-1997 production Souverän clip, you might have noticed a single word conspicuously struck into the material; “metal.” This can be found on the M/R/K/D 3xx, 4xx, 6xx, 8xx, and 10xx models. While the meaning behind the stamp may appear enigmatic at first, the truth of the matter is actually rather simple. Rest assured, this does not indicate a forgery of any kind. While Pelikan offers no official statement to explain this, the supposed meaning is well documented, particularly amongst those who work with precious metals and the hallmarks that go along with them. Across the world’s markets, there are regulations governing how precious and plated base metals are identified. When there is a base metal that is manufactured or processed to simulate the appearance of precious metal and whose alloy contains less than a specified karat fineness, the law mandates that a marking shall be applied to acknowledge the presence of a base metal. Different regions may vary in the fineness of gold that stipulates such a marking. The statue is that whenever practical, the word ‘metal’ or the name of the metal should be struck on the base metal part(s). The clips of the Souverän pens are gold, silver, or palladium plated. Pelikan notes that their cap rings are cut off from a brass tube and then gold-plated. It would stand to reason then that the base metal for the clip is also made from stamped brass. A magnet will not stick to the clip of a Souverän which supports this theory since brass is an alloy of copper and zinc which makes it devoid of ferromagnetism. This is true regardless of whether the cap is sterling silver or vermeil. A plated base metal is necessary so that the clip has the requisite strength and endurance needed to do its job. A gold or silver clip would be too fragile and not have nearly enough spring. Since these clips are largely composed of a base metal, regulations stipulate that the clips be hallmarked as such. Manufacturers have approached this differently over the years. Some manufacturers use the term “metal” which is then accompanied by a number denoting the quality of the plating and/or the type of base metal used. In the past, Montblanc has added the word “Laiton” on their clips which indicated a brass base material. 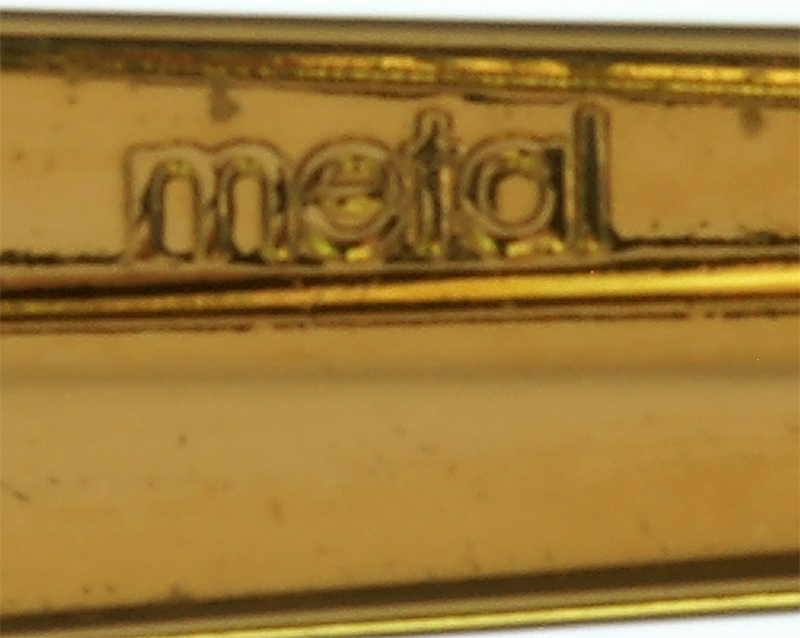 Pelikan simply uses the stamp “metal” without further embellishment. Neither this marking nor any other are present on pens of the Classic series such as the M200. Those clips are more likely to be a stamped steel rather than brass as they do demonstrate ferromagnetism. 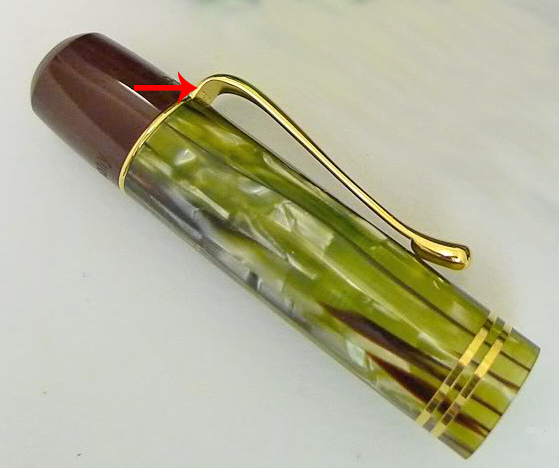 A magnet will actually stick to the clips of Pelikan’s lower tier models (go ahead and try it). Souverän pens manufactured prior to 1997 are also lacking the “metal” striking which could be due in part to when these regulations were adopted though this is only speculation on my part. More recently minted special edition pens such as those from the M101N series or the Originals of Their Time collection carry the additional stamp “Germany” along the clip. 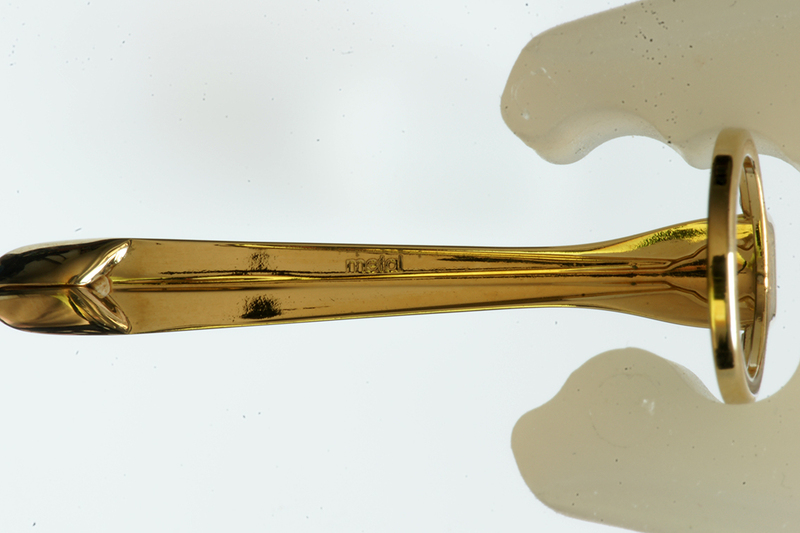 “Metal” also appears on these models but is stamped across the clip at the level of the bend near the cap top. Hopefully this explanation will help sate the curiosity of those who happen to stumble upon this mark and find themselves wondering what it could mean.